According to IDC Research, “customer service is the new marketing” in an age where the relationship that is built through service is what differentiates an organization or a brand. The customer support and service organization is now the clearinghouse for all customer concerns raised through a myriad of channels. With an increasing number of interactions taking place through digital channels, technology and processes that support proactive engagement, a corporate understanding that customer service is everyone's job, contextualized customer experiences informed by previous interactions and product usage, and integrated insight delivered through intelligently designed and applied self service systems are becoming critical. The new IDC Market Spotlight provides customer service organizations with step by step guidance around how to prioritize connecting front office to back office technology and processes to create an informed front office capable of resolving customer issues for good. 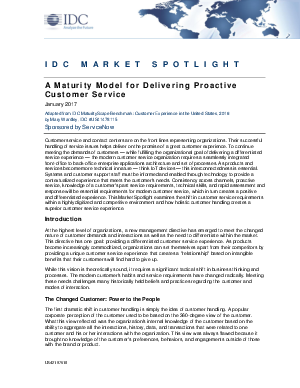 Get the IDC Market Spotlight.